CookieMaster is a WebExtension for Firefox that aims to provide control of cookies to ordinary users. It is inspired by the old pre-WebExtensions add-on called CookieMonster, although with some necessary differences for being a WebExtension, and that I wrote it from scratch. Cookies are divided into two types: first-party, and third-party. First-party are where the cookie is for the page you are browsing (or iframe that is loading), e.g. if you're browsing www.mozilla.org, then any cookies for mozilla.org are 'First Party'. Third-party are cookies set by requests for additional resources from other domains, e.g. if you're browsing www.cnn.com and it loads an image from doubleclick.net to serve and advert, and that image request tries to set a cookie, that's a third-party cookie. For first-party cookies, CookieMaster assumes that if you haven't explicitly allowed them, then they should be blocked. If you want cookies for that site, you need to interact with CookieMaster to tell it so (see below, in "How to use CookieMaster". For third-party cookies, the default assumption is that you do not want to allow any. However, to allow for other behaviours, you can also set it to either allow all third-party cookies (definitely not recommended), or to allow third-party cookies only if the domain has been explicitly added to CookieMaster's list (the same list as is used for first-party cookies). If you're using CookieMaster because you want to limit cookies, you're probably going to want to keep the default setting. CookieMaster inserts itself into the cookie processing at a couple of control points to block/delete cookies that have not been allowed. 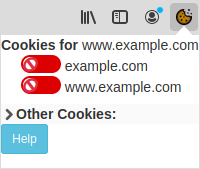 If a cookie is allowed, CookieMaster simply does nothing and lets Firefox do it's normal cookie handling. Therefore, you almost definitely want to have Firefox's cookie settings configured to "Accept cookies from websites", and possibly want "Accept third-party cookies" to something other than "Never". CookieMaster tries to alert you if your settings might lead to unexpected results, but it's worth checking at least once that your general Cookie settings are how they should be. 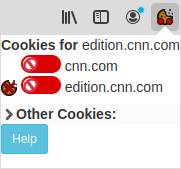 Notice how this time there is a blocked cookie icon to the left of the two domains (cnn.com and edition.cnn.com). This indicates that CNN tried to set cookies for both cnn.com, and edition.cnn.com, and both were blocked. There's a lot going on here. First up, notice that the cnn.com toggle is now green, with a tick. This says that when cnn.com next tries to set a cookie, it will be allowed. However, the last time it tried it was blocked, so the blocked cookie icon is still there, and the domain name is in italics indicating there's a mismatch of allowed domains to what has happened (we'll see a bit later what happens after a cookie is successfully set). Secondly, notice what's happened to edition.cnn.com. Remember earlier where we talked about sub-domains? This is where the rubber hits the road. Because I've allowed cnn.com, I have implicitly allowed edition.cnn.com, and any other sub-domains of cnn.com. The toggle now shows in the middle, with a tick, and gray. 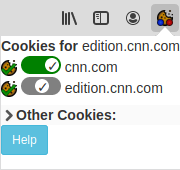 This indicates that cookies will be allowed for edition.cnn.com, but the reason is because it's implied by cnn.com being allowed, not because I explicitly chose to allow edition.cnn.com. 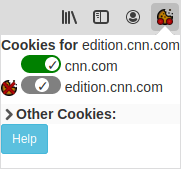 Now cookies have been set for both cnn.com and edition.cnn.com, as indicated by the cookie icon with a green tick, on the left. The italics are gone, because the cookie state matches what was allowed at the time. It should be pretty obvious that cnn.com tried to set a cookie but was denied, and edition.cnn.com tried and was allowed. While the possibilities get a little more complicated if you've got a multi-level domain like foo.bar.example.com, the basics are just the same, and should be fairly self-explanatory. To change preferences, and see the entire list of domains that have been permitted, goto "about:addons", or via the Firefox hamburger menu, click 'Add-ons'. Click the 'Preferences' button for CookieMaster. Here you can set your choice of third-party cookie handling. The default setting is to "Block All". You can also set it to either "Allow all" (definitely not recommended), or to allow third-party cookies only if the domain has been explicitly added to CookieMaster's list (the same list as is used for first-party cookies). If you're using CookieMaster because you want to limit cookies, you're probably going to want to keep the default setting. You can also see and manage the list of domains/sites that have been allowed to set cookies. To add one, type the domain in the top text box ("Website address"), and click "Add Site". The new domain will appear in the list box below. To remove one (or more), select them in the list box and click 'Remove Selected'. You don't need to know this, but if you're interested, here's a high level view of how CookieMaster works. Interestingly (perhaps), the actual blocking/allowing code was trivial. The hard bit was (and is) a vaguely sensible UI, and tracking which tab a cookie was set for. In particular, the cookie onChanged hook does not tell you which tab was involved in setting the cookie. See https://bugzilla.mozilla.org/show_bug.cgi?id=1416548 for where I asked that it be added, although unless I can learn deep details about Firefox code, is unlikely to happen anytime soon. It's worth pointing out here that cookies are far from the only way you can be tracked on-line, and a determined third party can probably still track you if they're willing to put in enough effort. Why are the icons awful and the extension ugly? Because I'm not a graphical designer; I'm a sysadmin with delusions of coding ability. If you'd like to contribute some patches/updates to make it look less terrible, I would be delighted. Bug reports, patches, or other contributions are all gratefully received.